This Totem Went All Tetris On Your Desktop | OhGizmo! Lexon’s MINITOTEM is meant for the office. 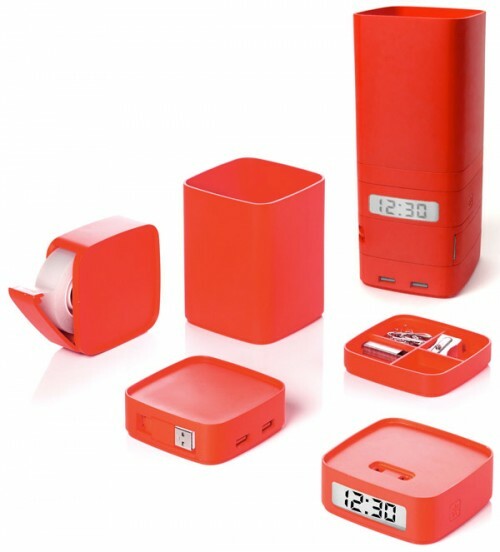 In one efficient stack, you get a pen cup, storage for paper clips, a clock, tape dispenser (tape included), and a 4 USB plug hub. All these objects nestle into one another more efficiently than even your best game of Tetris and make for a cleaner, neater work environment. Price unfortunately is not available, though the item appears to be in production. It looks like one of those things that should probably not cost a whole bunch, but you can contact them at contact at lexon-design dot com (trying to fool them spam scrapers) to find out, if you’re interested. a good space-saving idea, it’s perfect for my table full of sheets, etc.